Sviyazhsk, an island in the Republic of Tatarstan. Russia plans to take the initiative to propose Pskov and Sviyazhsk as World Heritage sites at the UNESCO organizations committee meeting in 2017. The architectural monuments of Pskov and Sviyazhsk are what Russia wants to propose for inclusion in the UNESCO World Heritage List. The issue will be discussed at a meeting of the organization’s committee in 2017, said Vladimir Tsvetnov, director of the Culture Ministry's department of cultural preservation, at the St. Petersburg International Cultural Forum on December 14. Irina Bokova, Director-General of UNESCO, told RIR, “the purpose of the organization is to put as many sites as possible on the heritage protection lists, but everything depends on governments – what sites they offer for inclusion.” "Russia has a great potential in the number of historical monuments and other sites," said Bokova. The architectural marvels of Pskov (400 miles northwest of Moscow) and Sviyazhsk (an island in the Republic of Tatarstan, which is part of the Russian Federation) are cases in point. "I would invite Russia to join the Convention for the Safeguarding of Intangible Cultural Heritage [adopted in 2003 – Ed], because I believe that your country is rich in tradition and cultural diversity. I spoke about this to Culture Minister Vladimir Medinsky at the meeting, he took it with interest." Bokova also mentioned a conversation with Medinsky relating to reconstruction and the dismantling of the Kremlin's 14th (administrative) building. "The documents for the reconstruction of the sites in the Kremlin have just been submitted by Russia to UNESCO – our experts will study them and provide a conclusion. The main thing is that there is a dialogue; that the decision is not taken without our knowledge. " 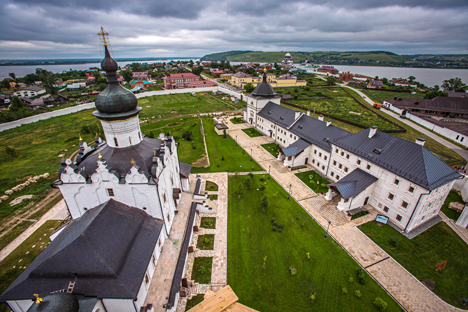 The UNESCO World Heritage List currently includes more than 20 sites in Russia. Six of them have been recognized as masterpieces of human genius, and 10 sites have been included on natural criteria. Four of them are considered "natural phenomena of exceptional beauty and aesthetic importance." The Historic Centre of St. Petersburg and Related Groups of Monuments and the architectural ensemble of the Kremlin and Red Square in Moscow, as well as Kizhi Pogost (a group of wooden religious structures on an island in Lake Onega in northern Russia) were the first Russian architectural sites to be taken under the protection by the UN special committee.